Little metallic bells attached to his track shoes acted as instant warning signals to competitors up ahead that Ken Norman was about to blow past them and into the lead. In his brilliant track career, first at Orrville High and then at Dartmouth College, there were very few instances of anyone leading Norman, and far fewer still where any competitor actually finished in front of him. 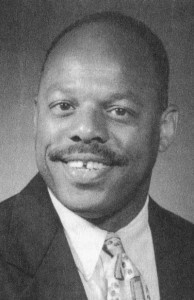 After placing fourth in the 200-yard dash as a sophomore—scoring the Red Riders’ first points at the State meet—Norman captured State sprint championships in the 200-yard dash as a junior and again as a senior in 1972. A lithe yet swift and powerful runner, Norman, who captained the OHS football team his senior season, also established the 440 mark at Orrville, a harbinger of where his running future was leading. Twice at Dartmouth, the Green Wave flash was named all-American, in 1975 and 1976. He set the Dartmouth record in the 440, at 47.3. Norman was a team captain both his junior and senior years and was selected MVP each season, his senior year capped by his earning the Alfred E. Watson Trophy as Dartmouth’s Outstanding Athlete of the Year in ’76. Before he hung up his spikes, Norman had clocked the world’s 13th-fastest 600 time ever run (1:09.1). His excellence extended into the classroom, where Norman eventually earned a Juris Doctorate law degree after graduating from Dartmouth with the highest honors—including the President’s Award for Exemplary Contribution to Dartmouth—and to his sense of patriotism, as he served as platoon leader (1976-78) while training nearly 700 men with the Marine Corps, where he advanced to the rank of First Lieutenant. Norman, currently a judge in Oakland, California, now uses a gavel instead of bells to announce his presence, still every bit the leader he was on the track.